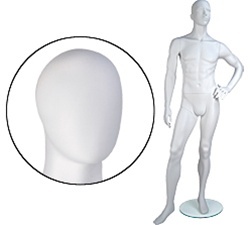 This Male Mannequin with an Oval Head, Left Hand on Hip, and Leg Forward is a highly stylized form with features that include detailed fingers and feet as well as a head with subtle detail. He comes in a beautiful cameo white finish and includes a tempered glass base, fittings for calf, and a a setup kit. Hip: 37", Neck: 12", Heel Height: 1"